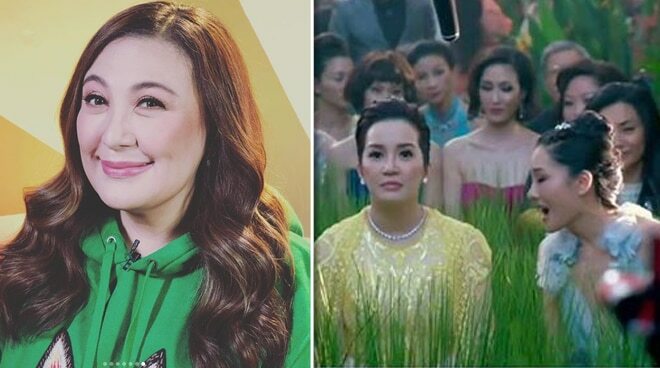 Sharon Cuneta took to social media to express her happiness for Kris Aquino, who recently had a cameo in the global blockbuster hit "Crazy Rich Asians." Kris played the role of Princess Intan in the movie. While she is happy for Kris, Sharon also expressed her frustration over those who are belittling the actress' short appearance in the film. "Sadly, it is very Pinoy to have what is known as “crab mentality;” you know - “Kundi ako ang successful sisiraan kita dahil sa inggit!” I said it didn’t sit well with me how some people were criticising Ms. Kris Aquino’s short appearance in “Crazy Rich Asians,” instead of celebrating that she was at all part of that Hollywood movie that has now hit #1 at the Box-Office. I thank all of you who left messages of encouragement for Kris as I requested. Guys, when one of us has the blessing of being chosen among hundreds to become part of a Hollywood movie - especially from a major studio and based on a best-selling book, we should be happy. Proud," the Megastar wrote. Sharon also remarked that Kris' inclusion in such a big Hollywood movie would help pave the way for more Filipinos to be part of the international movie scene. "It opens more doors in world cinema for Filipinos and other Asians, like Ms. Lea Salonga opened doors for many in Broadway. A short - but important - exposure in a film like this should’ve made us all root for Kris. Now, I know one thing that God in His faithfulness does: He brings you to a place with plans to bring you only FARTHER. Congratulations, Kris, Beej, QOAM! God bless you more. And thank you for making us dayuummm proud," Sharon posted.